The company understandably consolidated its small cell portfolio as part of the Alcatel-Lucent assimilation process. At its heart now is the Flexi Zone family of products, at the apparent heart of which is the Mini-Macro LTE base station, which claims to offer many of the benefits of a macro base station in a small cell form factor. Randy Cox, Head of Small Cells Product Management, led the briefing and explained that following the Alcatel-Lucent acquisition the combined company consolidated its small cell portfolio, with the emphasis on ‘densification’ of coverage and/or capacity in environments of heavy mobile broadband use. One big small cell client win seems to have been Sprint in the US, which has bought somewhere between 50,000-100,000 (Nokia declined to offer a precise number) of the Mini-Macros, which it has rolled out in a number of urban environments as well as specific ‘hot zones’ such as stadia. Cox was pretty bullish about the whole small cells category, as you might expect, and noted that he thinks we’ve finally entered the proper growth phase after years of false dawns. Nokia doubled its small cell unit shipments last year and demand is largely being driven by the US, China and Japan, it seems. On the flip-side Europe doesn’t seem to have got the small cell memo yet, with even Latin America showing more interest right now, we were told. One other key angle Nokia was keen to stress on this topic was multiband support for wifi and unlicensed spectrum. As we move towards a more heterogeneous connectivity environment Cox was keen to extol the growth opportunities that come with deploying small cells that support a number of different bands (see slide below). Technologies like LAA and MulteFire are apparently much better solutions for hot zones than wifi, as anyone who has tried to use the public wifi at airports will find easy to believe. 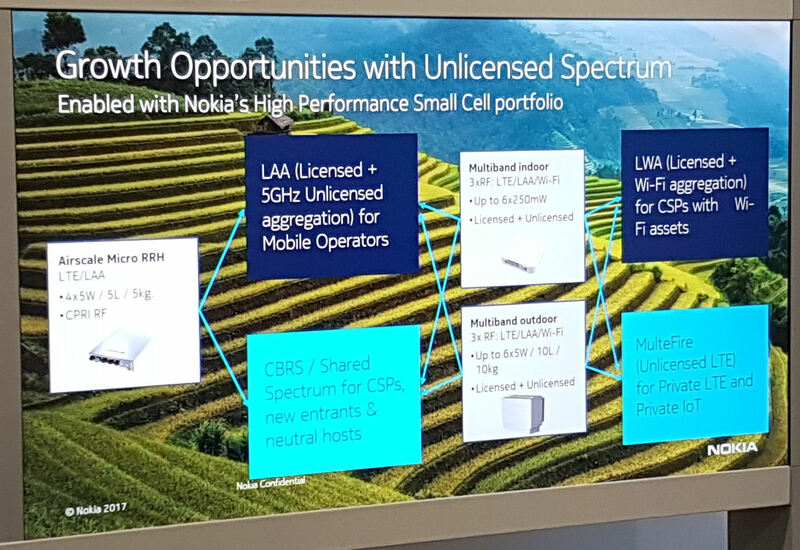 While the unlicensed LTE industry is still in its relative infancy, Nokia is positioning the deployment of small cells that support them as at the very least an act of future proofing.